Executive support is often touted as one of the most important, if not the most important pre-condition for a successful organizational transformation, be it Agile or otherwise. I agree. However, the nature of that support is not frequently defined. Worse still, I believe it is for most part misunderstood, especially by the executives themselves. In this post I cover some aspects of that support as I’ve encountered it in the wild. Let’s start with one thing executive support is not: a passive state. Support does not mean merely tolerating Agile (or Lean, or whatever; I’m not a stickler) in the organization, or just giving the green light for other people to change. It is not something to be exercised from a distance through intermediaries. I understand this may come to the great chagrin of some executives who were content to let things happen down there, way below them. 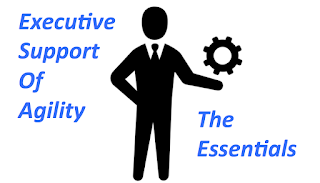 No, executive support is an activity, a role, a contact sport. The main reason is quite simple: organizations have a tendency to mirror their leaders. Thus, by definition, if an executive does not adopt Agile-compatible behaviors, neither will the organization. For example, it is critical for the executive to decree new, Agile-compatible values for the organization, and articulate the reasons why they are being adopted. If a senior leader cannot explain the sought-after benefits of the transformation, it will be difficult for employees to see the transformation as anything other than a passing fad. One caution: the leader should stop shy of instituting a specific Agile method. This is for the rest of the organization to figure out. Not only is the executive not in the best position to know which method is called for, but also the organization would then be even more susceptible to blind mechanical adoption (i.e. Cargo Cult). Another critical area where an executive demonstrates support for the transformation is on new and evolving job roles. For example, the Scrum method calls for new titles, like Product Owner and Scrum Master. Those roles will have to be defined in their scope and career progression, and proven “safe” for the first few employees who raise their hands for these roles. Correspondingly, some historical roles will evolve, sometimes a lot. For example, the traditional project manager who does a lot of intermediation may now be deemed counterproductive. Similarly the micro-manager and the lone wolf engineer may no longer be viewed as assets. Indeed, if an executive tolerates historical behaviors that are now harmful to the new culture, employees will deem this a lack of commitment. They will note the irony when their commitment is then sought. Moreover, the executive has to make sure that the good people, whom the rest of the organization knows better than the exec, have their fears and questions answered through this time of change. It can be a difficult balancing act. Finally, an executive must maintain a firm hand on the culture change tiller when the waters inevitably get rough. I strongly agree with the old saying that the main promise of Agile is to shine a light on the problems the organization already suffers from. Some of those challenges will be big, and this may be discouraging to the people of the organization. At that point, there is frequently a tendency to ignore the inconvenient Agile principles and to implement workarounds instead of confronting the difficulties head-on. Executive support requires that one maintain the pressure to change. I think there can be little doubt that executive support is much more than a mere agreement to go ahead with the transformation. It involves signaling and modeling the change from the front, while ensuring that the others actually follow. It is a key transformational success factor. Besides the aforementioned examples, what other major actions should an executive take? "Support", by Gregor Črešnar, The Noun Project, Web. 30 Jan. 2016. Modified.